Imagine getting up one fine morning and seeing the zits and breakouts on your face. This is very common when you are in your 20 and most of the times it appears when you are going out on a special occasion. Sometimes you end up thinking that even if you use high quality products and take proper care of your skin, the breakouts will persist. This is a wrong conception. 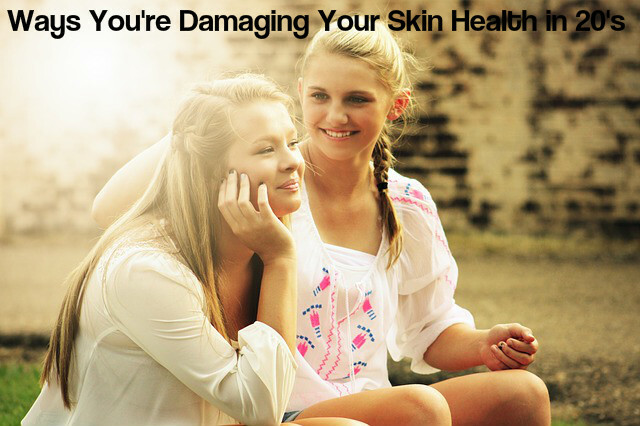 Here are a few ways by which you cause harm to your skin unknowingly. So read them and try to avoid them. The skin care products you use on your face can have some reverse impact on your skin and make your skin look dull and dry. So it is never too early to use anti-aging creams. Apply anti-aging creams on your face, chest, neck and your hands. Even if you have had a busy day and you are very exhausted, you must never go to bed without cleansing your face. You may feel lazy to do it, but it is a must and you have to do it no matter how late or tired you are. If not, it will lead to a buildup of dust and dirt on your face and may even result in bacterial infections. You need at least eight hours sleep if you want to have a healthy and glowing skin. Lack of sleep makes your skin dull and shallow, making you look older. It also gives you dark circles. Remember that a makeup product that works well on your friend’s skin may not work for your skin. So never buy products recommended by others. This can cause breakouts. So, before you buy a product, check and see if it is suitable for your skin type. Each time you touch your skin, the bacteria from your fingertips get transferred to your face. This can lead to breakout, acne and often dotted and uneven skin. Try not to touch your skin from time to time. Caffeine present in coffee can make your body dehydrated and the skin dry and dull. In addition, the fine lines on your skin may turn to wrinkles. If you consume too much of sugar your skin will suffer. Sugar causes the collagen to break down and this leads to glycation and sagging skin. So, limit the sugar intake and keep your skin healthy and tight. Stress can greatly affect your skin and make it dull and lifeless. Even if you use good quality anti-aging creams and other skin care products, you will not be able to solve the problem if you are stressed. So try to avoid getting stressed and take a break every now and then. Partying with friends is fun, but if you have the habit of drinking, it may dehydrate your skin and is not good for your health. So, always drink a glass of water after you have a drink. This will provide your body with the moisture that you have lost. Going out in the sun without applying a good sunscreen can greatly harm your skin. Always use a sunscreen that is suitable for your skin and wear a hat when you go out in the sun. By using the right sun screen you can prevent clogging of the pores and a breakout. Proper exercise every day is important and it keeps your body in good shape as well as provides a glow to your skin, making it look young and healthy. It is also good for getting rid of stress. Drink at least 8 glasses of water daily. This will keep your skin well hydrated and prevents dry and flaky skin. You will of course look gorgeous with dusky skin. But making your skin tan for this is not good for you. Tanning can lead to premature aging of the skin and even skin cancer. You can apply a self tanner or spray tan instead. It is often very embarrassing to go to college or office with a pimple on your face. So what most of the girls do is to prick it. You must avoid this habit. Let it pop on its own. If you prick your pimples, the pores will get larger and the spots will look worse. So, never prick them and damage your skin in doing so. Skipping meals can make your skin dry fast and also lead to premature aging of the skin. Make sure that you have your meals on time and have healthy snacks in-between to keep away hunger. This will keep your skin healthy and glowing. Sharing your makeup is not the way to show how much you love your friends or roommates. Sharing of your makeup kit with others may make you prone to skin and eye infections and other skin problems. So, it is better that you do not share your makeup with others no matter how you love them. Smoking makes your skin sag by breaking down the collagen and elastin. Drugs are very bad for your health and are also harmful for the skin. Avoid them if you want to have younger looking skin. Holding your phone for a long time against your cheeks may cause rashes and breakouts on the jaw line. Clean the screen of your phone everyday with an antibacterial wipe. Do not apply heavy makeup on your face. This will clog the pores of your skin and as a result the skin will not be able to breathe properly. This will lead to the breakout of acne. So always wear a light makeup that looks natural.